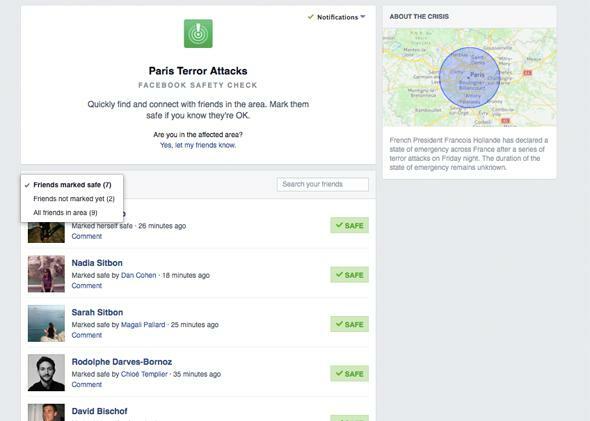 Facebook Safety Check feature used during Paris attacks. Facebook’s Safety Check feature shows which of your friends are in or near a crisis area and which have checked in as “safe” through the service. As attacks unfolded around Paris on Friday evening, Facebook users located in the city used the network to notify friends and family that they were all right. In addition to posting statuses, users were able to mark themselves as “safe” through Facebook’s Safety Check service. Facebook launched the feature in 2014 and offered it during the 7.8-magnitude earthquake that hit Nepal in April. Though the situation in Paris involves a violent attack, not a natural disaster, Safety Check operated somewhat similarly Friday. As with the earthquake, there are multiple incident sites and from the beginning the people who were potentially affected were dispersed over a large area. Facebook users can navigate to Facebook’s Safety Check on their own, but the social network is also sending push notifications to proactively let users know that friends have marked themselves as safe. Facebook can deduce that certain users are in Paris (because they have marked themselves as living there, checked in there recently, and so on) and prompt them to mark themselves as safe, but anyone can navigate to Safety Check and proactively indicate that they are OK.
Google also offers an emergency service called Person Finder, but it hasn’t yet been activated for the Paris attacks.